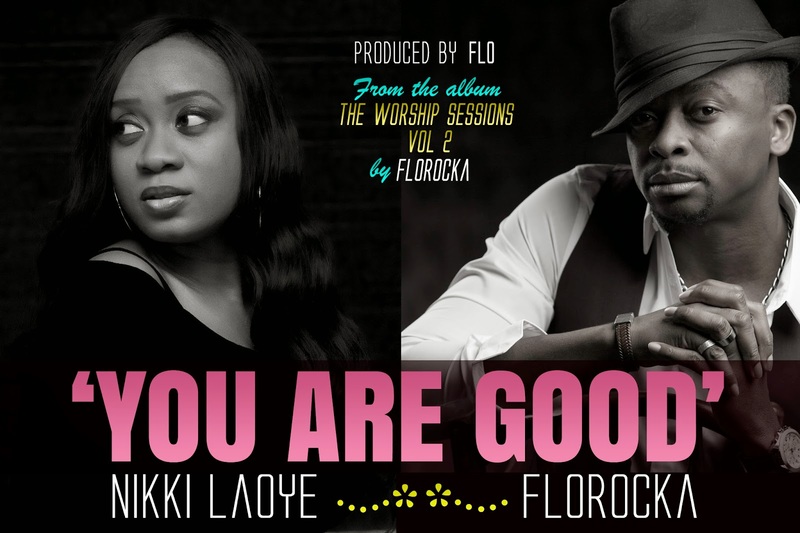 Multi-Talented Recording artist, FLOROCKA popularly known as FLO has just released another single, “You are Good”, off his recently released double CD album, The Worship Sessions Volume 1 & 2. "You Are Good" is a beautiful collaboration with the award winning singer, Nikki Laoye, the song is a soul stirring masterpiece of worship, superbly delivered by the two artists. “Whilst working on the 2nd volume of my Worship Sessions Album, I felt the urge to write about the goodness of God (Jesus Christ) to me. I had long yearned for a song that could give me room to express my gratitude. I then decided to title the song exactly the way i ‘felt’ – ‘YOU ARE GOOD’. I had just recently recorded the instrumentals and I’d begun voicing my lead vocals but I encountered a problem. I simply couldn’t go past verse One! The thought of a collabo never really crossed my mind and as such I kept biting at the song till I eventually got stuck! I’m extremely particular about who I feature on a song a lot of times. I love singers who pay attention to detail; singers who sing enunciate every nuance and observe the mood of the song, not just flinging riffs and runs at every space in between the the backing vocals. I love a singer who knows how to be true to the ‘song’ and not just the melodies behind the song in itself. I thought hard for a female whom I could feature and just then Nikki Laoye gives my mobile a buzz! Speak of perfect timing! I immediately asked her if she was game on a collaboration and she said YES! In less than 16 hours Nikki was at my ‘workshop’ (that’s what my buddy Mike Abdul loves to call my studio – only God knows why!!!). We discussed the song in depth and I succinctly expressed the inspiration behind the song. Nikki wanted to know what I expected of her – a rare attribute. Most eager singers would simply jump on the song in excitement and miss the very essence for which they were called upon for the collabo in the first instance. Nikki also besides being a soulful and versatile singer understands the ‘taste, touch and scent’ of music. She leaves no detail in a limbo. I take pleasure in making the best of good musicians and as such I decided I was going to write ‘vernacular’ lyrics for Nikki to sing – not just your everyday road-worthy vernacular lyrics. It was an interesting session as I watched Nikki soak herself in the song. We had to stop the recording at some point because Nikki became quite emotional. That was a sight I hadn’t seen in about 15 years of my recording career. I watched Nikki emote with such purity, I knew we’d nailed the song. A few spices of known songs here and there and the song was a wrap! Finally the song was released on my second album – The Worship Sessions 2. If you haven’t gotten yourself a copy, you don’t know what you’re missing." The Worship Sessions Volume 1 & 2 is available at Laterna Ventures (Oko Awo road, Opp Eko Hotel, VI); Bible Wonderland (Surulere) and every online retail store – iTunes, Amazon etc.